He said: "Professor Maathai introduced the idea of women planting trees in Kenya to reduce poverty and conserve the environment," in a statement released via his office. "At last count, the Green Belt Movement she helped to found had assisted women to plant more than 40 million trees. She understood and acted on the inextricable links between poverty, rights and environmental sustainability. One can but marvel at her foresight and the scope of her success. 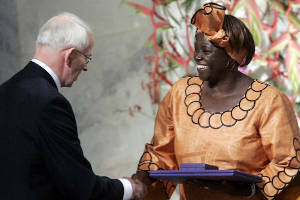 She was a true African heroine," the statement continued.